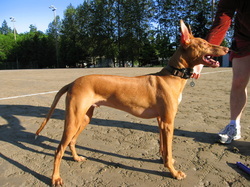 Anubis was our very first Pharaoh Hound. He came to us at 8 weeks old, as a pet, and we have been hooked on the breed ever since. He is a bit moody just like his mother Fuji, and grandpa Kal-El, but he rules the roost and keeps everyone else in line. Anubis is our vocal PH and loves to bark to encourage the others to play with him. He is more aloof but at night when he wants attention he will jump up on the bed and crawl under the covers!Anubis loves lure coursing and earned his SC title. He may not be the fastest PH on the field but he has the most heart and dedication to the sport. It is truly a joy to watch how much fun he has running. In addition, Anubis is Herding Instinct Certified. He loved herding and thought those sheep were giant bunnies! He has recently jumped into the realm of straight/oval track racing and has 1 leg of his JOR title finished. 1st Place, 4 pts New ASFA Field Champion!!!!! Q in Instinct New RATI!!! !